St. David was born around the year 500, and was a Welsh Bishop of Menevia during the 6th Century. He is regarded as a saint, and is the Patron Saint of Wales. He was a native to Wales. The date of his birth is still uncertain, and could be as early as 462, but most scholars believe it to be around 500. St. David was famous in his time as being a teacher and preacher, founding monastic settlements and Churches in Wales, Dumnonia, and Brittany. St. David’s Cathedral stands on the site of the Monastery he founded in Pembrokeshire. He was ordained a Priest, and rose to the level of Bishop. He presided over two synods against Pelagianism, the belief that original sin did not taint the soul at birth. The first synod was held at Brefi around 560, and the second at Caerleon in 569. It was while he was in Brefi, that his best-known miracle is said to have taken place. While preaching in the middle of a large crowd at the Synod, the ground on which he stood is said to have risen up to form a small hill. A white dove, which became his emblem, was seen settling on his shoulder. He denounced Pelagianism at this same time, and it was here that he was declared Archbishop. St. David drafted a Monastic Rule, in which he stated that Monks had to pull the plow themselves, rather than with draught animals; they must only drink water and eat only bread with salt and herbs, and spend the evenings in prayer reading and writing. They were not allowed personal possessions under his Rule, including calling something as simple as a book, “My book”, everything was community owned. He lived a very simple life and practiced asceticism – the absence of worldly pleasures, teaching his followers to refrain from eating meat and drinking beer. Some claimed that St. David lived for over 100 years, and that he died on a Tuesday, March 1st. It is generally accepted that this was around 589. The Monastery where he died is said to have been “filled with angels as Christ received his soul”. His last words were, “Be joyful, and keep your faith and your creed. Do the little things that you have seen me do and have heard about. I will walk the path that our fathers have trod before us”. A very well known phrase in Wales today is, “Do ye the little things in life”. St. David was buried at St. David’s Cathedral at Pembrokeshire, where his Shrine was a popular place of pilgrimage throughout the Middle Ages. The Vikings raided the Shrine of its precious metals in the 10th and 11th centuries, and in 1275 a new Shrine was constructed. The ruined base of the old Shrine remains to this day. St. David is also thought to be associated with “Corpse Candles”, lights that would warn of the imminent death of a member of the community. The story goes that David prayed for his people to have some warning of their death, so that they could prepare themselves. In a vision, David’s wish was granted and told that from then on, people who lived in the land of St. David “Would be forewarned by the dim light of mysterious tapers when and where the death might be expected”. The color and size of the tapers indicated whether the person to die would be a woman, man, or child. 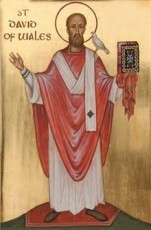 St. David was born in Wales and was a Bishop of Menevia. He governed his monastery by following the example of the Eastern Fathers. Through his great leadership, many Monks went forth to evangelize Wales, Ireland, Cornwall, Brittany and the surrounding provinces. He built many Churches and monasteries, and was said to have built St. David’s Cathedral in Pembrokeshire. He lived a very simple, humble life, giving up meat and beer. He preached for people to drink water and eat bread with herbs, rather than eating meat and drinking beer as a sign of offering up for our sins.